1. Mohonk Preserve (New York): The Mohonk Preserve is a great place to hike because they have multiple trail options ranging from easy to difficult. Cupid’s personal favorite is the Lemon Squeeze Hike, although it takes a good amount of physical fitness to complete. But then again, it could be a” mind over matter” task. 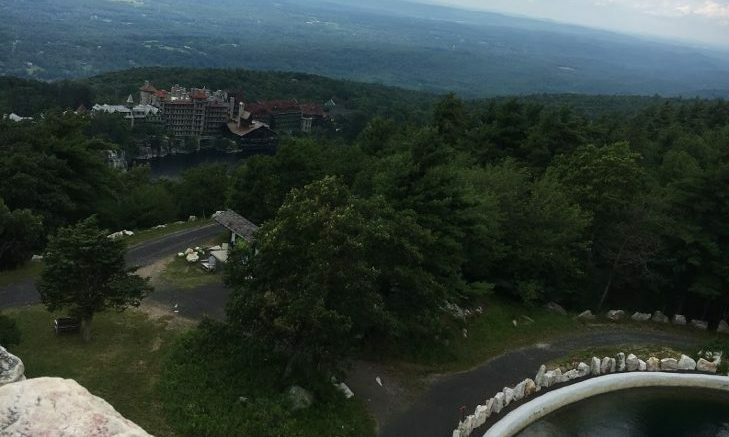 This place is perfect for a romantic getaway, because there is a beautiful resort right on the preserve called the Mohonk Mountain House. Plan a weekend and stay at the beautiful Mohonk Mountain House in the Hudson Valley with your partner! You can spend your days hiking, doing water sports in the lake, and just enjoying nature. 2. Glacier National Park (Montana): This is a fabulous place for both hiking and camping. You can secure a campsite in advance at any of these locations: Fish Creek Reservations, St. Mary Reservations, Apgar Group Site Reservations, or Many Glacier. This destination will really help you and your partner get in touch with nature as you may come across some bears! Be on the lookout, and enjoy all of the wonderful things that nature has to offer. 3. Grand Canyon (Arizona): If you have not traveled to the Grand Canyon yet, it is definitely worth it. Travel with your partner to admire the beauty of the red rock together. The best time to hike along the Grand Canyon is around sunrise or sunset. The history of the Grand Canyon is very interesting as well! Feed both your mind and body with knowledge and exercise as you and your boo take the trip..
4. Arches National Park (Utah): Arches National Park exhibits beautiful naturally formed sandstone arches that are great to take pictures with your partner for an Instagram opportunity! This is a very cool hiking spot. You can camp there as well, although camping space is limited. Remember to bring a backpack filled with water and snacks for the hike! 5. Olympic National Park (Washington): Have you ever put up a suspended tree tent? It’s a tent that is almost like a hammock because it is positioned in the air tied to two trees. Olympic is the perfect place to do so and check it off your bucket list! This area offers more than just typical hiking; it has three completely different ecosystems, including a rainforest! Amazing. 6. Badlands National Park (South Dakota): This landscape offers dramatic scenery of rock formations. You and your partner can come across fossils as you hike through the variety of trails — Door Trail, Saddle Pass Trail, Castle Trail, Cliff Shelf Trail, Fossil Exhibit Trail, and more! Related Link: Top 5 Romantic Getaways in the Northeast U.S.
7. Hot Springs National Park (Arkansas): Camping doesn’t always necessarily have to be combined with hiking. This camping experience offers a natural spa treatment for you and your partner. The waterfront atmosphere makes for a romantic natural experience! Anywhere you decide to travel will be amazing as you are experiencing nature with someone who means a lot to you, and not much can top that! Which hiking or camping destination do you want to travel to for a date? Comment below!